Concord, harmony, is a good title and topic for a book. 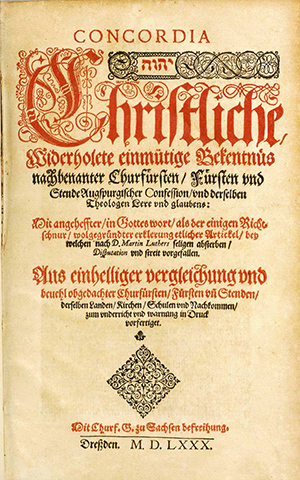 The Lutheran Confessions, formulated over years and first collected and published in 1580, provide a formula for ongoing concord in our joint walk (synod) as Lutheran Christians. Historically confessions served three functions. They identify, clarify, and unify. The same principles still apply for Lutherans who worship all around the world. “We believe, teach and confess that the gospel is not a proclamation of repentance or retribution, but is, strictly speaking, nothing else than a proclamation of comfort and a joyous message which does not rebuke nor terrify but comforts consciences against the terror of the law, directs them solely to Christ’s merit, and lifts them up again through the delightful proclamation of the grace and favor of God, won through Christ’s merit” (Formula of Concord V,7). The Lutheran Confessions are deeply concerned about the gospel and eager to see it proclaimed clearly and earnestly. They likewise consider the experience of the individual Christian’s faith and repentance, deeds and hopes. Thus the Confessions clarify, as precisely as human language allows, what the Bible teaches about God, sin, Christ, justification, church and ministry, repentance, the sacraments, free will, good works and other articles of faith. They identify abuses in doctrine and practice, and most clearly state what Lutherans do not believe, teach, and confess. They are declarations of belief, making clear that Lutherans have convictions which are not open to question. The Confessions clarify the Lutheran concern that only the Word be taught. Theologian Ernst Kinder noted, “Our preaching must be actually addressed to modern man, but it must be identical in its essence with the preaching of the apostles and prophets! It is this which the confessional statement sets forth.” One response to Jesus’s directive to make disciples by baptizing and teaching was the development of creeds and rules of faith to clarify the gospel truths upon which the Christian church is founded. As Luther’s Bible united Germans, so the Confessions united Lutherans. In Studies in the Lutheran Confessions, Willard Allbeck notes, “The Confessions were, or became, the voice of a group, of a movement to which many persons were committed.” Within the boundaries of Lutheranism, the Confessions constitute the basis for Lutheran unity. Preceded by other writings and collections, the Book of Concord soon became the standard in confrontations with Roman Catholics or Calvinists. Where a Lutheran position seemed unclear or uncertain, the Book of Concord became a reference for the authentic Lutheran view. Whereas the writings of Luther, as notable as they are, reveal the insights of one man, the Confessions are classical expressions of evangelical theology on the whole. They state the full meaning of the doctrine of salvation. The gospel is good news to be communicated—a message received and handed on. A Christian of necessity must teach a doctrine, bearing witness to the content of the faith and making known the word of God. The Lutheran Confessions serve this missionary purpose well. We may continually say with the apostle Paul, “What I received I passed on to you as of first importance: that Christ died for our sins according to the Scriptures, that he was buried, that he was raised on the third day according to the Scriptures” (1 Corinthians 15:3).